Waihi Senior rugby sides had mixed fortunes after the latest round of Thames Valley club rugby. Both sides were at home to Thames, with the Senior B's giving the home crowd plenty to cheer about when in the early game they came away with a hard fought 20 -17 win to remain unbeaten after two rounds. Waihi held a narrow lead throughout the game scoring three good team tries. It was a tense final few minutes with Thames getting to within three points,but Waihi's defence held firm for a well deserved victory. The Senior A game was a replay of last year's championship final with Thames intent on reversing that result. In unseasonal wet conditions, Thames started strongly, using their big forward pack to lay a solid platform, giving their backs plenty of quality ball to work with. They scored two first half tries and went into the half time break with a handy 20-6 lead. Waihi needed to start the second half well, but it was Thames who scored first adding another try to their tally. This forced Waihi into playing catch up mode rugby. With the rain still falling mistakes were made, resulting in two more Thames tries and running out 41-9 victors. With many players missing from last years team, this was a steep learning curb for this new look young squad. To their credit, they never gave up and will be a better team for this experience. 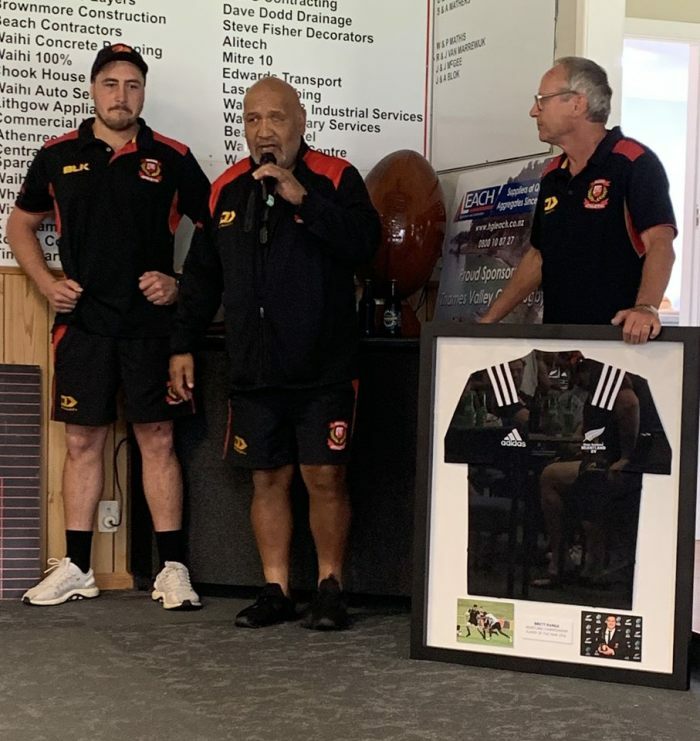 Brett Ranga and Zac TeWake shared the player of the match awards, with Brett producing Waihi's highlight of the day presenting his New Zealand Heartland jersey to the club at the after match function. Next Saturday both teams travel to Waitakaruru to take on Hauraki North with tough games expected. Photo: Waihi Athletic Rugby Club - Brett Ranga presenting his New Zealand Heartland Jersey XV to the Waihi club. Copyright 2015 © Gold FM All rights reserved.